Heading for Edinburgh? Here's a quick guide to give you the flavor of the place and to help you get there, get around and have some fun. Scotland's capital and the seat of its new Parliament, combines the young and modern sensibilities of a great university city and national capital with a historic and dramatic setting. 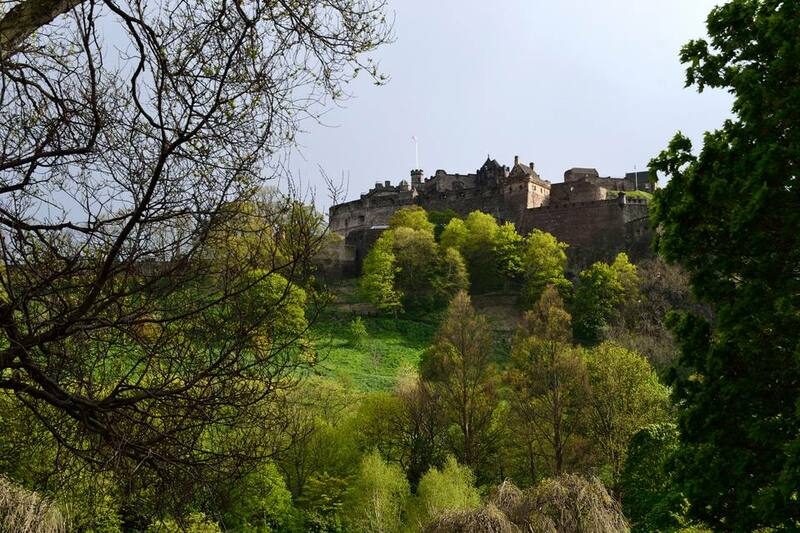 Here you'll find the world's biggest performing arts festival, a 1,000 year old castle and a mountain - Arthur's Seat - right in the middle of town. And, Edinburgh's annual post New Year's celebration - Hogmanay - is a street party to end all street parties. Edinburgh has 448,624 people, including more than 62,000 university students. It has about 13 million visitors a year. During the main festival month of August, the population of Edinburgh swells by more than one million, making it, temporarily, the UK's second largest city. The Scots capital sits on the south coast of the Firth of Forth along the southeast coast of Scotland. It is 47 Miles east of Glasgow and 413 miles north of London. Directions to Edinburgh by Train, Car, Bus and Plane. Summers are cool and winter temperatures are moderated by Edinburgh's proximity to the sea. But don't be fooled by the lack of snow and below freezing temperatures. Edinburgh is a windy and cloudy city. According to the Encyclopaedia Britannica, it gets only about a third of the sunshine possible for its latitude. Nights can be chilly and interiors can be draughty and chill - plan on bringing rain gear, and warm sleepwear. Edinburgh Airport supports about 50 airlines, with flights to 85 destinations in the UK, Ireland and Europe. It has a limited number of flights to North America and Canada. An airport express shuttle bus to the city center operates every 10 minutes and the new Edinburgh tram will deliver you to Princes Street, right in the heart of the city for just a few pounds. Glasgow International Airport is Scotland's main international gateway. Most flights are to and from Europe but there are also regular flights from the east and west coasts of the USA and Canada. Waverley Station for national rail links. Haymarket Station for western suburbs and some trains to Glasgow. West Lothian buses operate local buses throughout the city and its near suburbs. Exact change required so check the current fares on their website.Daytickets for unlimited daily travel, packets of single tickets and airport shuttlebus tickets can be purchased online via their website. Edinburgh Trams - The new tram service runs from the airport to Princes Street in the city center every 8 to 10 minutes. The trams are probably the most convenient and cost effective way of traveling to the city center from the airport, but as a visitor their usefulness for getting around the city to other locations is limited. The Princes Street Gardens divide Edinburgh into an Old Town and New Town. But "new" is relative so don't expect modern skyscrapers -- Edinburgh New Town dates from the Georgian 18th and early 19th centuries. The Palace of Holyroodhouse The Queen's official residence in Scotland and site of some of the most tragic episodes in the life of Mary Queen of Scots. The Scottish Parliament The stunning - and expensive - new home of Scotland's devolved government. Climb a mountain At 822 feet, Arthur's Seat is the highest of Edinburgh's many hills. It is an extinct volcano in the middle of central Edinburgh and the climb through Holyrood Park to the top of it can be a challenging hike. Don't worry - you can drive most of the way to enjoy the magnificent views of Edinburgh Castle and the Old Town. See how much architecture £431 million can buy That's what architect Enric Miralles' steel, oak, granite and Caithness stone Scottish Parliament cost to build. But visiting is free and so are scheduled guided tours - many with special themes. but the story of the dog who spent 14 years pining at his owner's grave and whose licence was paid for by the Lord Provost of Edinburgh, is a true one. There's a statue of the faithful Skye terrier outside Greyfriar's Kirk and, this being Scotland, there's a pub right next to it where you can raise a glass to him. Ring in the New Year Why celebrate New Year's for one day when you can do it for four? Edinburgh's Hogmanay could be the best New Year's ever. Geoffrey (Tailor) - Kiltmakers and Weavers, 57 High Street, Old Town, Edinburgh, +44 (0)131 557 0256. Ya Gotta Laugh - Best of Comedy on the Fringe.